In Rio de Janeiro, baby macaw, Blu, is captured by dealers and smuggled to the USA. While driving through Moose Lake, Minnesota, the truck that is transporting Blu accidentally drops Blu's box on the road. A girl, Linda, finds the bird and raises him with love. Fifteen years later, Blu is a domesticated and intelligent bird that does not fly and lives a comfortable life with bookshop owner Linda. 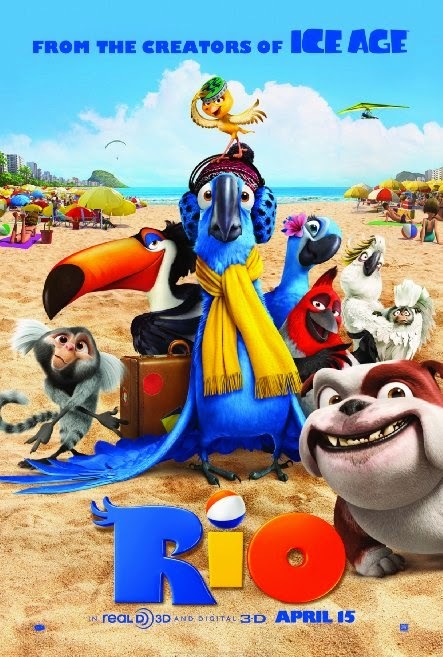 Out of the blue, clumsy Brazilian ornithologist, Tulio, visits Linda and explains that Blu is the last male of his species, and he has a female called Jewel in Rio de Janeiro. He invites Linda to bring Blu to Rio so that he and Jewel can save their species. Linda travels with Blu and Tulio to Rio de Janeiro and they leave Blu and Jewel in a large cage in the institute where Tulio works. While they are having dinner, smugglers break into the institute and steal Blu and Jewel to sell them. Linda and Tulio look everywhere for Blu, who is chained to Jewel and hidden in a slum.